With a reliance on synth-pop and programmed parts in a lot of mainstream music today, you’d think artists and producers were playing video games while creating hit songs. There’s a certain musicality about it that some acts really like. In fact, music and video games really go hand in hand, especially now that well-known musicians have a much greater role in the content. However, there was one such case where a landmark video game, one that took in billions of dollars in both game play and additional merchandise, made the final leap and became the subject of a top ten hit in early 1982 thanks to one of the earlier uses of sampling. 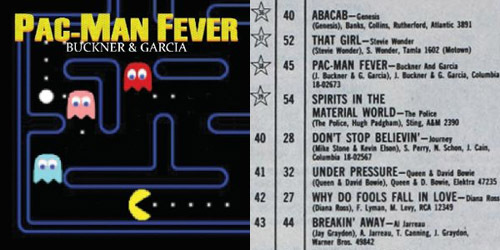 From the joystick to a joyride up the charts, this is Buckner & Garcia with “Pac-Man Fever”. Pac-Man, of course, is the famous arcade game and the name of the game’s title character, who zips around a maze looking to eat up a series of pac-dots and the occasional cherry before the four colorful enemies attack. First introduced in Japan in the spring of 1980, it made its way to the U.S. by the fall of the same year and became one of the most recognizable figures in video game history. Heavy sales were almost immediate, both by individual players in arcades and those who desired units for personal use. Chances are you’ve probably played it or some variation of it, like Ms. Pac-Man or Super Pac-Man. It was also in 1980 that Buckner & Garcia first cracked the Hot 100 with a Christmas record. “Merry Christmas In The NFL” was the title, credited to Willis The Guard & Vigorish, and it spent a week at #82 on the chart dated December 27, 1980. The song imitated sports journalist Howard Cosell as Santa Claus with a chorus of cheerleaders, which Cosell didn’t particularly like, though the shelf life of the song was obviously limited. However, bigger things were on the horizon for the twosome, who had been together and recording since the 1960’s. With that arcade game on the brain, they hit the jackpot. Today, January 30, back in 1982, “Pac-Man Fever” rose from 45-38 on the Hot 100, becoming the duo’s first and only top 40 single. It would peak at #9 for two weeks in March and April on the Hot 100 and slowly descended (for the time) down the top 40. (Billboard had adopted a policy in February 1982 which led to an overwhelming amount of stall-outs followed by sharp falls.) “Fever” also peaked at #7 on the Cashbox Singles Chart, a leading competitor to Billboard at the time, but it’s noticeably absent from the airplay archives compiled by Radio & Records, which like Cashbox is now defunct. Either the song was under-reported, or it was primarily attaining points from sales and jukebox rotations. Nevertheless, the song was a hit; it was certified Gold and parent album Pac-Man Fever (featuring other video game themed songs) also went Gold. After that sudden breakout success in the spring of 1982, it was inevitable that the duo was to remain a one-hit wonder with their novelty track. Follow-up single “Do The Donkey Kong” just missed the Hot 100 by a few spots (#103) a few months later. No other singles charted from their debut effort, though the two musicians continued writing for other artists and for commercial jingles for the next few decades. They also recorded a few new original tunes along the way. Gary Garcia passed away in the fall of 2011, but with the help of writer and producer Jamie Houston, he and Jerry Buckner completed a song credited to the duo, “Wreck-It, Wreck-It Ralph”, a theme song for the principal character of the 2012 film Wreck-It Ralph. For more chart action faster than a hunt for cherries, keep it locked on PGTC and follow the blog on social media via the “Get Social!” tab.